The first time you visit Egypt, you could be forgiven for thinking you'd landed in chaos. The frenzied arrival at Cairo airport - awash with djeballa-clad minions and baby soldiers in threatening uniforms, all shouting like mad - is just the beginning. In Egypt, "Insha 'Allah" (the will of God) is more a way of life than a philosophy. It's also an excuse for a laid-back bureaucracy that would try the patience of a saint as you try to get through customs. "Madam," said an officer to a particularly impatient tourist, "insults are not helpful." Once through the airport, things improve mightily, especially when you arrive at your hotel by the languid River Nile, collapse in an untidy heap with a cold gin and tonic, and watch the moon come up over the slim minarets of the city's hundreds of mosques. Cairo is one of the great cities of the world - chaotic, bustling and polluted as it is, it is also sophisticated. The many and varied buildings reflect the imperialist nature of Cairo's eclectic past - from crooked medieval Moorish houses with intricate latticed windows that once hid the harem, to the crumbling grandeur of French Art Deco and imposing turn-of-the-century British colonial. And it is full of cultural contrasts. Rich Cairenes wear enough gold chains to moor the QM2 those less endowed float about in cassata-coloured djeballas. Donkeys weave between traffic; stately camels stroll across the Nile bridges, while old men sit in the dust drinking mint tea delivered by smiling urchins. There are infinite attractions for visitors, but start with the Egyptian Museum with its glorious muddle of antiquities - great stone sarcophaguses, looming statues built on a scale that suggests their creators were 50 metres tall, delicate pottery, and the treasures of the tomb of Tutankhamun. So vast is this extraordinary collection, it takes up the entire second floor of the museum. You'll see his wooden throne decorated with falence, glass and gold, hunting shields covered with leopard skins, ivory chests, ostrich fans, follies of turquoise glass and stone, even his shoes, gloves and knickers made of the finest Egyptian cotton. The newly refurbished Mummy Room has recently been reopened for tourists too. It's where you'll see the dignified mummies of ancient Egyptians sleeping peacefully through the centuries. This collection of preserved aristocrats who ruled Egypt from 1552 to 1069 BC includes the most famous of all Egyptian pharaohs, Ramses II. Visitors are not allowed to speak and are expected to maintain a standard of behaviour in respect for the revered dead. Pharaonic emblems of a cobra and a vulture are also on show, along with an awesome collection of jewellery. At the souvenir shop attached to the Egyptian Museum, you can buy good copies of many of the artefacts on display. But if you want jewellery, it's best to go Khan al-Khalili, the centuries-old maze of a bazaar which specialises in fine antiques and jewels. Here, the gold price is set by the government each day so you won't be ripped off. Other Cairo sights are Saladin's Citadel, an extraordinary complex built in the twelfth century to defend against the Crusaders, and the seat of Egyptian power until last century; the great mosques of Sultan Hassan and Mohammed Mi (no shorts or sleeveless shirts are permitted inside); and the Necropolis or City of the Dead, where the recently bereaved often come to picnic or spend the night in the company of their departed loved ones. There's an Arabic saying, "Man fears time, but time fears the pyramids." Once you glimpse these towering, 4,500-year-old structures at Giza on the outskirts of Cairo, you'll understand why. Best seen in the glow of a scarlet sunset, they are not only a monument to immortality - their scale and permanence seem to mock the shifting sands and suburbs below - but the very symbol of the country itself. The Luxury Travel Bible recommends at stay at Mena House Oberoi , an historic palace built in the shadow of the great pyramids. See Cheops from the window of your suite. Built by the pharaohs Khufu, Khafre and Menkare, the pyramids also provide a bonanza for the touts and hawkers who hassle you every second of your visit. The only thing to do is to smile a lot, even though you'll feel like thumping them. If they suggest you ride down to the Sphinx on one of their camels, be sure to pay them at the end of your trip, otherwise you'll find yourself unceremoniously dumped halfway down the track. You can climb the interior of the second pyramid but an outside scramble to the top is now forbidden. Each evening, there's a stirring son et lumiere performance which is well worth seeing. Take a sweater or shawl as the desert night air can be freezing. 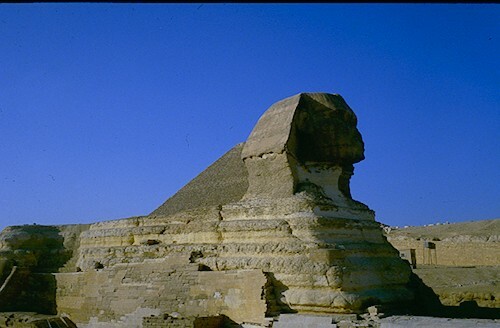 Memphis, the ancient capital, and the Saqqara necropolis are nearby and provide an enticing look at Egypt's earliest history. When you're done with Cairo, hasten to Upper (or southern) Egypt with its temples, markets and friendly locals who know the value of the tourist dollar, substituting with smiles the militant attitudes of the fundamentalists who lurk in Middle Egypt. The starting point for Upper Egypt is Luxor, a remarkably well-preserved ancient capital that's been a tourist attraction since the days of the Roman Empire. Before setting off to tour the temples, it's worth visiting the fabulous refurbished palace that is now the Old Winter Palace Hotel on the Corniche, which features in practically every movie made in Egypt. To see its exquisite interiors, panelled halls, and the mind-blowing views of the river from the terrace, is well worth the price of an outrageously expensive glass of Egyptian wine (which isn't bad - Omar Khayyam is probably the best white, Chateau Gianaclis the best red). A truly memorable experience is to take a horse-drawn carriage to the Karnak Temple (Egypt's largest), a conglomeration of pylons, avenues of ram-headed sphinx, sanctuaries, sacred pools. There is a regular son et lumiere here too, and those of us whose archaeology is a bit ropy found it helped put the whole overwhelming experience into some sort of perspective. (Make sure you go on a night when it's performed in English as it alternates with French, German and Arabic versions). The Luxor temple is situated alongside the boat dock and makes a rewarding visit. Once joined to Karnak by a long avenue of sphinx, it is more fragile and one of my favourites. Make sure you look upwards at all the nineteenth-century graffiti scribbled on the top. No, it wasn't left by mountaineers who scrambled to the top to leave their names; the temple was excavated from the sands which had once virtually buried it. From Luxor, you take the ferry across the river to the Valley of the Kings. Here, during their lifetimes, the pharaohs built themselves the tombs which, for so many centuries, have intrigued the world. Dug deep into the stone walls of the valley or tunnelled beneath soaring cliffs, they were homes for the after-life. Painted walls, huge sarcophaguses, twisting corridors and false doors designed to thwart grave robbers provided decades of work for the gifted slaves of ancient Egypt who themselves merited no such monumental splendour. The Valley of the Kings, and the Valley of the Queens and Nobles, gives visitors a true insight into the visions of Egypt's long-dead rulers. The paintings depict rich vineyards, great hunters, parties, scenes of domestic bliss and glimpses of everyday life, complete with ducks, cats, birds and people playing music. Many of the tombs have painted ceilings showing Nut the goddess of Night, awash with stars, or Anubis, the jackal-headed god of the Underworld leading the pharaohs int oeternity. It's heady stuff, indeed. Don't miss the tombs of Seti I and Ramses IV, probably the finest resting places you'll ever see. The paintings depict rich vineyards, great hunters, parties, scenes of domestic bliss and glimpses of everyday life, complete with ducks, cats, birds and people playing music. Many of the tombs have painted ceilings showing Nut the goddess of Night, awash with stars, or Anubis, the jackal-headed god of the Underworld leading the pharaohs into eternity. It's heady stuff, indeed. Don't miss the tombs of Seti I and Ramses IV, probably the finest resting places you'll ever see. If you're lucky enough to be with an expert guide they will organise to be at the Valley of the Queens at the crack of dawn to make sure you get the prized ticket into the tomb of Queen Nefertari. Hailed as the finest tomb in all Egypt, it was built by Ramses II as a shrine to his queen's beauty and fully restored to its original condition in 1995. Every centimetre of the walls of the three chambers are covered with exquisitely colourful paintings depicting Nefertari in the company of the gods. To preserve the art-work, only 150 tickets are sold each day. Luxor is a logical place to join a river cruise, taking in the temples of the falcon-headed Horus at Edfu and the crocodile god Sobek at Kom Ombo before arriving in Aswan. Cruising is far and away the best way to visit the area. There's something magical about waking to a lemon-lit, heat-filled morning beneath the towering columns, gigantic statues and the sound of braying donkeys. It also means you don't have to stagger too far to enjoy them. At Aswan, at the base of the twin English and Nasser dams, we headed straight for the Sofiitel Old Cataract Hotel, where Agatha Christie wrote 'Death on the Nile', with its pretty view of Kitchener Island, taking tea on the terrace while below us fleets of feluccas, the sailing boats which ply the river, skimmed across the water like swans. There's much to do in Aswan but one of the highlights must be a visit to the temple of the Aga Khan, which involves a long climb up the steps or a donkey or camel ride. There's also the Philae temple, one of the prettiest in Egypt, the restful botanical gardens on Kitchener Island, and a fleet of graceful feluccas which can take you upstream to see the famous Nile cataracts. From Aswan, a coach trip to Abu Simbel will deliver you to the bizarre netherworld of Ramses II, Egypt's megalomaniac pharaoh whose high opinion of himself is reflected in the number of monuments he ordered to be built in his own honour. His temple at Abu Simbel is also dedicated to his favourite Nubian wife, Nefertari. Not only is this temple awesome in both scale and execution, it is also a marvel of modern engineering, having been rescued from the rising waters of the Nasser dam, then moved stone-by-stone to a drier, higher place. It was a mammoth modern- day project which fittingly paralleled the building of the original pyramids and temples of the Nile. As confounding as it initially is, Egypt and its dusty splendour touches all but a few hearts - that's why it's been attracting awestruck visitors for centuries.